Yes, I know it's Tuesday. We've had family in town since Friday and I forgot to schedule this, so I am a day late. Continuing on the theme of Japanese poetic forms, the sedoka is an unrhymed poem made up of a pair of katauta. A katuata is a three-line poem with the syllable count of 5 / 7 / 7. Generally a sedoka addresses the same subject from different perspectives. You can read more about the sedoka at Encyclopedia Brittanica. I hope you'll join me this week in writing a sedoka (or two). Please share a link to your poem or the poem itself in the comments. Dodoitsu is a Japanese poetic form. Similar to other Japanese forms, it does not rhyme and is not focused on meter, but rather on syllables. Dodoitsu is a 4-line poem with a syllable count of 7 / 7 / 7 / 5. Generally the subject of these poems is love or work. They also often contain a bit of humor. You can read more about this form and see a few examples at Poetic Asides. I hope you'll join me this week in writing a dodoitsu (or two). Please share a link to your poem or the poem itself in the comments. We left last Friday to visit family in NY. Our trip up should have taken just over 5 hours by plane, but it turned into a 15+ hour odyssey. We did finally make it and had a wonderful 6 days. 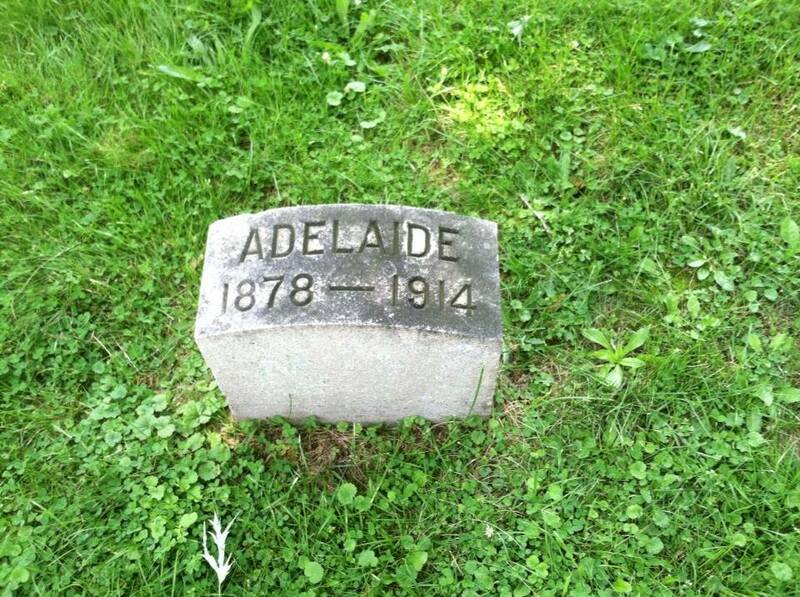 On our last day in Rochester, we made a short visit to Mount Hope Cemetery. I visited once in high school (many moons ago) and knew the graves of Frederick Douglass and Susan B. Anthony were there. However, on this visit I learned that someone appropriate to the Poetry Friday set was here as well. 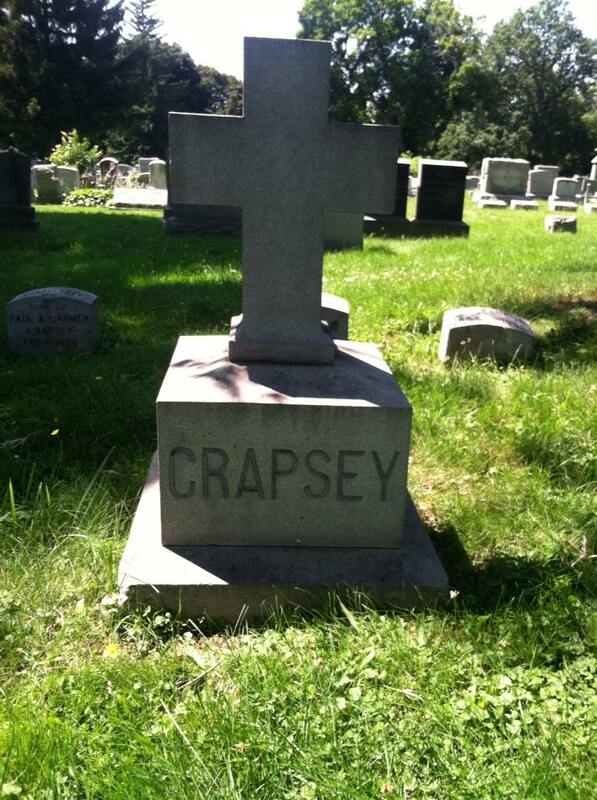 In honor of Adelaide Crapsey, here is a cinquain of hers. I do hope you'll take some time to check out all the wonderful poetic things being shared and collected today by Kimberley on Google+. Happy poetry Friday friends! Ae freslighe (ay fresh lee) is an Irish poetic form. Each stanza is a quatrain with lines of seven syllables. The rhyme scheme is a b a b. In forming rhymes, the end rhyme in lines one and three is three syllables, while the end rhyme in lines two and four is two syllables. Finally, Irish poetry is cyclic, so the poem should end with the first word or entire first line. Here's what the poem form looks like. You can read more about this form at The Poets Garret and Creative Bloomings. I hope you'll join me this week in writing an Ae freslighe (or two). Please share a link to your poem or the poem itself in the comments. This month the poetry seven were tasked with writing poems "in the style of." We had quite a bit of discussion about what this meant before we ever got off the ground. When we settled on e.e. cummings I was terrified, and that's putting it mildly. While I may eschew punctuation and capitalization in my poems, I don't usually play with them in the manner of cummings. Okay, confession time. I have always disliked the poetry of e.e. cummings. There, I said it. His poems have always made me feel dumb. I just don't get them, and (I say this rather immodestly, but I'm a pretty smart cookie), when I don't get the gist, I get frustrated. Perhaps I never read cummings widely enough, but after struggling with a few of his poems, I gave up, never to return to him again. Enter this month's writing project. As the poet of the style of choice, I jumped into reading cummings again. I'll admit I still don't get most of his stuff, but I did find some pretty amazing pieces. I floundered for quite a while with different topics, but after the shootings in Charleston I knew I needed to write about it. I try not to write when I'm emotional, as the poems tend to come from a dark place. My first drafts were very dark and darn depressing. They needed something more, but I didn't know what that was. On the Sunday following the shootings, the homily focused on embracing hope and rejecting despair. In thinking about Father Jim's words, I realized exactly what my poem was missing, and so my single poem became a pair. One of our esteemed members (Andi!) suggested we record our poems this time around. I'm not sure I've captured the emotions I was experiencing as I wrote these, but I'll leave that for you to decide. Now that you've read and heard my poems, here is the e.e. cummings' poem I chose to emulate. To date, this has been the most difficult challenge for me. I am most grateful to the group this month for leading me to cummings as I've never known him. You can read and listen to the fabulous "in the style of" poems written by my Poetry Seven compatriots at the links below. Tanita Davis - in the style of "the Cambridge ladies who live in furnished souls"
Kelly Fineman - in the style of "maggie and millie and molly and may"
Sara Lewis Holmes - in the style of "in-Just"
Laura Purdie Salas - in the style of "Spring is like a perhaps hand"
Liz Garton Scanlon - in the style of "i like my body when it is with your"
Andi Sibley - in the style of "the wind has blown the rain away"
I do hope you'll take some time to check out all the wonderful poetic things being shared and collected today by Katie at The Logonauts. Happy poetry Friday friends! National Poetry Month is long over, but I believe in poetry EVERY day and still have forms and interviews to share. So without further ado, another wonderful poet weighs in on form. Today I'm sharing the thoughts of Bob Raczka, author of numerous books about art and art history, the seasons, as well as poetry. Recent poetry titles include Presidential Misadventures: Poems That Poke Fun at the Man in Charge (2015), Santa Clauses: Short Poems From the North Pole (2014), Lemonade: and Other Poems Squeezed from a Single Word (2011), and Guyku: A Year of Haiku for Boys (2010). 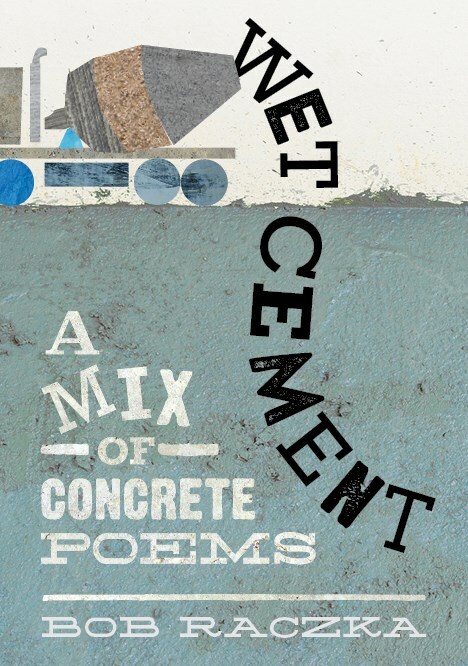 I'm looking forward to a new book coming out in 2016 entitled Wet Cement: A Mix of Concrete Poems. How do you begin a poem? Or, how does a poem begin for you — with an idea, a form, an image, or something else? Bob: I usually (but not always) start with the form. And it helps to have a theme in mind. For example, my book Santa Clauses consists of 25 haiku “written” by Santa. Haiku are about nature, so when I started writing, I thought about things in nature that are unique to the North Pole, and that might make an impression on Santa. Pretty soon, I was writing poems about the northern lights, reindeer and snow hares. How do you choose the form of your poems? Bob: Most of the time I’m inspired by other poems. For example, I just finished a manuscript of 20 poems that I’m calling “skinny sonnets”. The form is based on a 14-word sonnet written by a poet named Frank Sidgwick in 1921. His abbreviated sonnet is called The Aeronaut to His Lady, and once I read it, I knew I had to try one for myself. 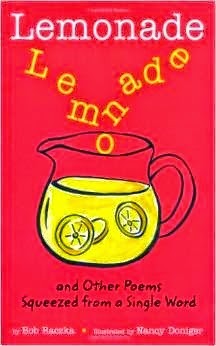 The same thing happened with my book Lemonade, which was inspired by an anagram-like poem called rain by a poet named Andrew Russ. Are there any forms you haven't tried but would like to? Why or why not? Bob: There are many forms I haven’t tried. I tend to gravitate toward shorter forms like haiku, cinquains, clerihews and limericks. I find them easier to wrap my head around. Call me a minimalist. I also don’t have a lot of time to write poetry with my day job in advertising, so the shorter forms work well with my schedule. That’s not to say that short forms are easy, or that I don’t rewrite my short poems many, many times. I do love the fact that you can say so much, and be so clever, with so few words. What tools (rhyming dictionary, book of forms, etc.) do you use in writing poetry (if any)? Bob: I love my rhyming dictionary. It’s paperback and the edges are well-worn from all of my quick-flipping back and forth. I also have quite a collection of poetry books for inspiration, mostly adult poets. Some are anthologies, others are by individual poets. One book that I return to again and again is Poem-Making: Ways to Begin Writing Poetry by Myra Cohn Livingston. What would you like students or children to know about poetry? Bob: First, poetry is about playing with words. So if you like playing with words, or seeing how other people play with words, chances are you’ll like reading and writing poetry. Second, don’t expect to like—or even understand—every poem you read. Poems are like books, and poets are like authors: you’ll like some more than you like others. Third, reading poems is a great way to slow down and appreciate the little things in life. I like to read a handful of nature poems before I go to bed. It makes me feel good and helps relieve any stress I may be feeling. Finally, one of your esteemed colleagues suggested I ask for a poem in a foreign verse form. Would you be willing to share a poem for this project? Poem ©Bob Raczka, 2015. All rights reserved. A million thanks to Bob for participating in my Jumping Into Form interview and for waiting ever so patiently for it to post. My apologies to my fellow writers who have come around looking for stretches. I just spent two amazing weeks with a group of teachers and thought of little beyond math, math, and more math. Poetry relies on a great deal of math, from rhyme scheme (patterns) to counting syllables to forms that are based on mathematical sequences (Fibonacci numbers). Today I've selected a form that generally relies on syllable counting. Poets.org defines the cinquain in this fashion. The most common cinquains in English follow a rhyme scheme of ababb, abaab or abccb. I'll admit that the first part of this definition was unfamiliar to me. It was only this second part that I recognized. This is the form that is taught in schools alongside haiku and diamante, though I'm not fond of the didactic approach generally taken, which consists of listing words related to a topic (adjectives, action verbs, etc.) . If you are looking for some guidance, Kenn Nesbitt has a nice page on how to write a cinquain. For a bit of inspiration, here's one of my favorite poems by Adelaide Crapsey. I hope you'll join me this week in writing a cinquain (or two). Please share a link to your poem or the poem itself in the comments.